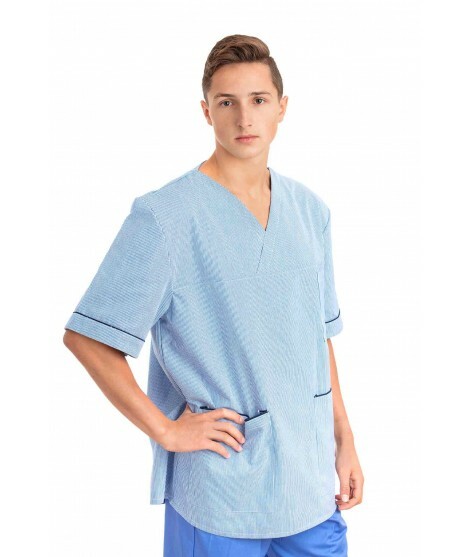 Full-coverage lab coats with are finished with fully knitted cuffs made of 65% polyester and 35% cotton. The garment provides protection against dust, dirt and harmless liquid splashes. Ideal for use in non hazardous laboratory environments, in general hygienic areas and in hospitals and medical environments. Medco's Howie Lab Coat has been a consistently popular seller for the company since it was first introduced to our online store. With orders coming in from as far away as Australia and the United States, this protective clothing lab coat features elasticated cuff closing The high, Chinese-style collars provide operators with additional protection compared with other more conventional lab coats and all pockets have Velcro closing flaps to ensure safety at all times. Can be supplied in other colours, call us for details and we will help where possible. Longer length for more protection: ca. 48"
Centre back length 110cm 43"